The AudioSmile Supertweeter has been designed to supplement narrowing dispersion of existing speakers in the high frequency range, extending to 40KHz. Designed and hand built Simon Ashton, this supertweeter features two low distortion magnetic-planar ribbon units made from conductivity etched lightweight film suspended between a neodymium push-pull magnet system. The circuitry is made using only low ESR film type capacitors and low DCR inductors. The Sound is given increased openness and vibrancy, making recordings feel more alive. Soundstage is extended in width and height, while vocals and instruments are bought in to the room with greater detail. Speaker Matching is one of the most important considerations when adding a supertweeter to an audio system and the MK3 excels in this regard. Every loudspeaker has different sensitivity, frequency characteristic and dispersion pattern. In addition, room acoustics play a significant role in how high pitch sound is absorbed or diffused. This is why the Supertweeter MK3 has been designed to offer the greatest possible flexibility in settings and physical placement. The front control offers 6 level adjustments, while the rear control allows selection of 14KHz, 16KHz & 18KHz filters. Adding even further options, the unique body shape allows the Supertweeter MK3 to be placed with ribbons facing either upward, forward or angled. Dual planar ribbons are angled at 90 degrees to supplement the main loudspeakers off-axis dispersion, while not overly affecting the direct on-axis balance. Integration of this supertweeter can be tuned to the finest degree. The body is elegant frosted black acrylic with a chamferd losenge highlighting each ribbon element. The ends are hand crafted from solid Walnut (darker) or Birch ply with a walnut face veneer (stripy edge). Connections are made by 2mm ‘micro’ banana plugs that are fully inset within the wood end pieces, allowing connections to be hidden under the supertweeter when positioned forward facing. Supertweeters - How do they really work? The supertweeter attracts some debate in audio circles about how it can possibly work - it's all above our hearing range 20Hz-20KHz, right? The primary reason for hearing a change in sound when adding a supertweeter is that contrary to myth, most supertweeters produce output within our traditional hearing range at an audible level. This is because filters do not simply cut all sound below the set point, they apply a gradual reduction, still leaving much to be heard below 20KHz. Therefore it is not the supertweeter extension that matters, it is the quality of the sound reproduction at the top of the standard musical range. My speakers extend to 20KHz, why do I need a supertweeter? The majority of modern tweeters are capable of reproducing the full audible range, but only directly on-axis in front of the driver. 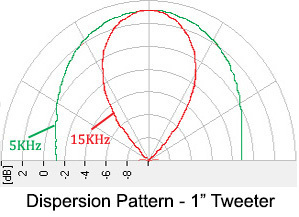 At 5KHz a typical tweeter will have a wide disersion pattern spreading sound in to all areas of the room, while at 15KHz the dispersion is much more narrow much like a direct beam from the tweeters center. The result of this behaviour is less sound energy in the room at high frequencies than the midrange. Our hearing averages all the sound in the room, so we hear an unblanced reproduction lacking high frequency information needed for position localisation (soundstage and imaging).